The 2018-19 Fayette boys basketball team. 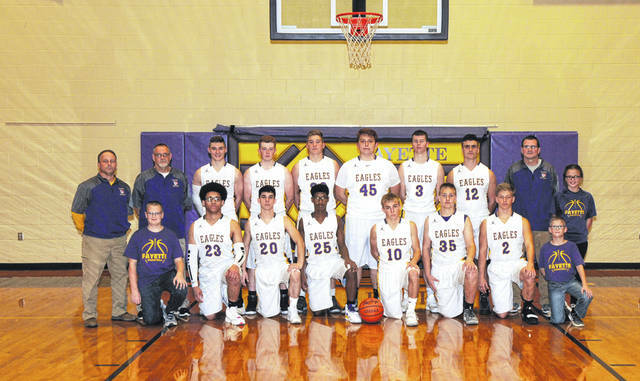 The Fayette boys basketball team posted a solid 15-9 record a season ago, and returns their two leading scorers from that squad in 2018-19.
Notable returnees for the Eagles include guards Trey Keefer (first team All-Buckeye Border Conference, second team District 7) and Clayton Pheils (second team All-BBC, honorable mention District 7). Keefer averaged 13 points per game and four rebounds per game last season, while Pheils averaged just over 10 points per game. Also back are Tanner Lemley (4.4 ppg, 3.2 rpg), Noah Brinegar (4 ppg), Porter Maginn and Caden Colegrove. Newcomers for the Eagles are Jaxsen Wentz, Jose Aguilar and Jermaine Livingston. However, they will have to replace the production left behind by the departure of three letter winners. Gone from the squad are Karrsen Schaffner (honorable mention All-BBC), Travis Wagner, and Grant Reinking. Those departures leave some holes in their lineup. “We don’t have a lot of size so our post defense and rebounding will require a great team effort,” explained Mitchell. The Eagles hope to improve their win total from a season ago. Last year they were 9-4 in BBC play. Fayette hosts Antwerp tonight to begin the season.